Have questions about tie dye ? We have answers! Check out our list of frequently asked questions to find the answer you're looking for. Don’t see it? Contact us now. Give us call at: 1-800-438-6226. Do all of the supplies I need for creating a marbling dye project come in the kit? Do I have to use the Marbling Medium in the kit for the dye to work? Yes. The Marbling Medium is specifically formulated to activate the dyes and make them permanent on fabric. The dyes will not permanently dye fabric on their own. Do I need to add or mix anything with the Marbling Dyes or Medium before using? No! Both the Marbling Dyes and the Marbling Medium are ready to use as is – no extra prep steps necessary! Just shake well, use scissors to cut off the tips from the bottles and apply. How long does it take to make a Marbling Dye project? From start to finish, you should have your completed marble-dyed project in less than 24 hours! The dyes only take 8 hours to set (or overnight if you prefer), then simply add on the amount of time it takes you to prep and wash and dry your project. It’s that simple! How much Marbling Medium do I need to use for my project? The Marbling Medium is very important for activating the dyes and helping them absorb into the fabric. We recommend using a generous amount for the water-dye method (enough so the surface area of the water is completely covered by the Medium). For the tabletop method, less is needed since you can use your gloved hands or a tool to spread the Medium evenly on the covered table surface. How much Marbling Dye do I need to use for my project? It depends on how colorful you would like your project to be and what type of pattern you are looking to create! You can choose anywhere from 1 to 3 dyes from your kit; we recommend using a fair amount of color, but not so much that the colors blend too much together and turn brown when creating your marbling effects. How long will the Marbling Dye and Medium last after opening? If I don’t use all of the product in one sitting, can I save it for another day? Yes, your Marbling Dyes and Medium can still be used for future projects if not all used in one setting. Just make sure to replace the caps on the dyes and twist the cap on the Medium closed to keep air from drying out the product. Is it possible to dye both sides of a project? How do I do that? Yes, it is possible, you’ll just need to complete the entire dye process on one side at a time (let set 8 hours then wash and dry each side). Make sure to place protective plastic like a garbage bag or plastic cloth in between the layers of the garment to prevent the dye from soaking through to the backside. My dye colors turned out faded on my project. Why did this happen? Check your fabric. Did you use 100% natural fiber fabric like cotton, rayon or silk? Natural/synthetic blends of fabric will dye lighter than natural fabrics, and synthetic fabrics will not dye at all. Did you use a generous amount of Marbling Dye applied over a generous amount of Marbling Medium? Not using enough dye or Marbling Medium can result in lighter colors. Did you allow your project to set for at least 8 hours with the dye and medium (this applies whether you used the tabletop method or the water-dye method)? If you rinsed and washed it before this amount of time, most likely your dyes did not get the chance to set to their full potential. If you used the water-dye method, did you use luke warm water? We recommend a luke-warm water temperature for best results. Dyes generally cure better in warmer temperatures. My dye colors turned out brown and “muddy” in some places on my project. Why did this happen? Dye colors often become muddied (brown) when too much mixing happens between the different colors. You might have “combed” through the dyes too much when creating your swirled/feathered designs. My marbling design turned out blurry instead of clean, sharp lines. Why did this happen? Not using enough Marbling Medium when water dyeing can result in more of a soft, watercolor effect versus clean, sharp design lines. My project still feels oily after washing. How can I make sure it’s fully clean? Using a spray nozzle sink attachment (or hose if outside) will really help to remove excess dye and medium from the fabric. Hand washing in warm water (after rinsing) with a liquid degreasing detergent such as Dawn will greatly help in removing excess oils from the fabric. This method is highly recommended for shoes, making sure to thoroughly clean the bottoms of the soles because the product is very slippery. Wash project in washing machine with warm water and air dry. What are some best practices for cleanup after creating a marbling project? Place a bucket inside the sink to catch the runoff. Because the medium and dye are very thick, they will clog your pipes if the go down the drain. The products will float on the surface of the water in the bucket after you finish rinsing your project. Lay paper towels on the surface of the water in the bucket to soak up the dye and medium, then throw away. Repeat until all product has been removed from the surface of the water. You can also use a disposable cup to scoop up and throw away as much product as possible, and use paper towels to absorb the rest. Pour remaining clean water down the drain. Some excess product may still remain on the sides of the bin; wipe away with paper towels until fully removed. What happens if I pour the dye and medium down the drain while/after rinsing my project? Because the medium is so thick, it will end up clogging your drain. Do not pour down the drain, and instead collect the runoff in a bucket as you rinse your project, then wipe away the layer of product with paper towels or scoop out and throw away in the trash. 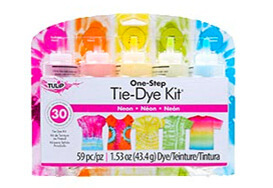 Where can I buy Tulip® One-Step Tie-Dye Kits®? Tulip One-Step Tie-Dye Kits can be purchased at these participating retailers: A.C. Moore, Hobby Lobby, Jo-Ann Fabrics, Michaels, Meijers and Walmart, as well as on amazon.com and of course, here at tiedyeyoursummer.com! Where can I buy Tulip outside the US? Why is it called "One-Step Tie-Dye?" Our Tulip One-Step Tie-Dye Kits include great color combinations of permanent dyes that are packaged in easy squeeze bottles, so all you have to do is add cold tap water, shake it up and tie dye! This saves you time and it’s easy to do—no special soaking, no extra ingredients needed. What other supplies do I need for my tie-dye projects that are not included in the tie-dye kits? Our Tulip One-Step Tie-Dye Kits contain all of the tie dye supplies you’ll need to create a project (aside from the fabric), but to protect your work surface, you’ll need a disposable plastic tablecloth or a plastic garbage bag to cover the area before dyeing a project. And if you create with a lot of enthusiasm, you’ll want to wear old clothes or an apron to protect yourself. Do Tulip® One-Step Tie-Dye Kits® have to be used with hot water for a successful tie-dye project? No, our Tulip One-Step Dyes activate with cold tap water—they’re super easy to use! Just add tap water up to the fill line marked on the bottle and shake, and you’re ready to go. What are the recommended fabrics to use to get the best results when tie-dyeing? We recommend using our tie dye products on fabrics that are 100% natural, such as cotton, rayon and silk. Our dyes are formulated to absorb into the natural fibers, which is why they hold their color so well, washing after washing. Manmade synthetic materials such as polyester, acrylic, nylon, etc. do not absorb these dyes very well or sometimes not at all. If you want to experiment, try on a similar fabric swatch first. Can I tie dye fabric that is 50% cotton and 50% polyester? You can use cotton blends, but the color will not be as vibrant as 100% natural fibers like cotton, silk and rayon. Can I tie dye on other items besides fabric? Our dyes are formulated to be the brightest and last the longest on natural fabrics. That said, however, we’re all about creative experimentation and new ways to apply tie-dye techniques! We’ve seen our dyes used on hair extensions and to create tie-dye looks on paper and wood… Just be sure to test first so you won’t be disappointed with the results. Just remember not to use our tie-dye products on utensils or items that come into contact with food. Do I need to pre-treat fabrics with soda ash before tie-dyeing with Tulip® One-Step Tie-Dye Kits®? No, you don’t! Our One-Step Dyes are specially formulated with soda ash already in the dye powder, so all you have to do is add water, shake it up and you will be ready to create all of your favorite tie-dye designs. Do I need to soak my dyed fabric in salt water before tie-dyeing? No need for a salt soak, but we do recommend washing your fabric to remove the sizing (a product that keeps the fabric stiff and minimizes wrinkles), as sizing can block the full absorption of the dye pigment. And don’t use your fabric softener in the wash cycle—it adds in more chemicals that may affect the dye colors. Does it matter if my item is wet or dry before I start tie-dyeing? We generally recommend washing your fabric and leaving it damp before tie-dyeing, as the dye has an easier time saturating the fabric when it’s wet. But depending on the technique and the look you want, you can apply dye to dry fabric. Just make sure the fabric has been washed (if it’s new) to remove the sizing. Applying dye to dry fabric results in more color saturation but less uniform permeation throughout the fabric. I would like to tie dye over a fabric that’s already colored; do I need to bleach the existing color before tie-dyeing? It depends on what you want to make and the tie dye design and look you’re going for. If you want to tie dye the fabric a darker color, we recommend using a tie-dye color within the same color family as the existing color on the fabric (i.e. from Light Pink to Fuchsia). Any color outside of the color family may turn muddy or brown. Bleaching out the colored fabric before tie dyeing will not completely remove the base color and may not create better results when tie dyeing. Can I use other Tulip® dyes such as Tulip® Permanent Fabric Dye in the Tulip® One-Step Dye bottles? No, because each type of Tulip Dye is created with a different application purpose in mind. Tulip One-Step Dyes are formulated differently than our other dyes and activate by adding cold tap water to the dye in the easy applicator bottles—a super fast way to prep and go for tie-dye techniques. Our Tulip Permanent Fabric Dyes require very hot water and salt in a larger container such as a bucket or sink, and our Tulip Liquid Dyes are meant for use in a washing machine. Is there a difference between using rubber bands, zip ties and string? Each binding tool creates a slightly different effect, but all work great for binding tie-dye projects. What if I accidentally ingest or breathe in some of the dye powder? Is it harmful? Accidentally inhaling a little bit of tie-dye powder might turn the inside of your nose or tongue the color of the dye, and may cause irritation. Remove as much dye as possible with running water, and get medical attention if irritation persists. First Aid Treatment: Contains organic dye and sodium bicarbonate. If swallowed, contact a poison control center or doctor immediately. Do not induce vomiting. If in eyes, rinse with water for 15 minutes. If on skin, rinse well with water. How long should I let my tie-dye project dry before washing? We recommend covering your fabric with plastic after applying your dye to keep it damp for 6 to 8 hours; this helps the dye really soak in and reach its full color concentration potential. Once the tie-dye project has set for 6-8 hours, make sure you thoroughly rinse the fabric under running water until the water runs clear, then remove the rubber bands or ties, and wash as instructed. I accidentally spilled dye on an unprotected surface; what are the directions on how to remove the dye stain? We know accidents happen! Use paper towels to immediately absorb the spilled dye (remember to keep your gloves on). If the dye was spilled on a surface such as laminate or tile, try cleaning up any remaining stains with a bleach product. If the dye was spilled on an unvarnished absorbent surface like wood, you might not be able to remove any remaining stains. This is why we strongly recommend using disposable plastic tablecloths or large trash bags to protect your work surface before tie-dyeing. How do I dispose of leftover tie-dye kit products once I am finished using it? Is it okay to pour down the sink? In general yes, it is safe to dispose of leftover dye by pouring it down a drain. You may want to check your city’s waste disposal regulations as a precaution. I didn’t wear gloves and got dye on my hands: what's the easiest way to remove the dye? The dye will eventually wear off, but if you don’t want to wait, you can try a heavy-duty soap like Lava Soap. Sometimes we like showing off our colorful hands, but we do get funny looks. How can I prevent dried spots of dye on my work surface after I’m finished tie-dyeing? Once you’re finished with your tie-dye project, make sure you thoroughly clean your work area. Those random dried spots of dye and dye powder can activate if touched with water. You don’t want those kinds of surprises when you’re working on a different project. How long will the dye last once it’s mixed with water? Can I use it at a later date if I don’t use all of the dye during my project? Once the dye has been activated by mixing with water, it will last up to 72 hours, so we generally recommend using your dye within that timeframe. We've heard that some designers have used our tie dye products after that timeframe with good results, so your best option is to test the dye on a small swatch of fabric to check the vibrancy. What water temperature should I wash my tie dye in for the first wash? We recommend washing your newly tie-dyed fabric in cold water on delicate cycle for the first wash. Hot water can cause a significant amount of dye to wash out of the fabric after first dyeing it. After several washes you should be able to return to your normal wash cycle. What kind of laundry detergent should I use to wash my tie-dyed fabric? Only use detergent without color bleach or fabric softener to wash newly tie-dyed fabrics. Both fabric softener and color bleaching agents will pull the dye from the fabric, causing it to fade. Can I wash dyed clothing with my other laundry? We recommend washing dyed fabrics at least three times separately before washing with your other laundry, as the dye color may bleed out a little bit during the first few washes. Will the dye stain my washing machine when I wash dyed fabric? It shouldn’t stain your washing machine, but if you notice any discoloration, run another wash cycle (without fabric) and include at least a cup of bleach in the cycle. Can I wash multiple dyed fabrics together in the washing machine? We only recommend washing multiple dyed fabrics together if they are dyed with the same color scheme. If the fabric items each have different colors, they should be washed separately to avoid muddying and dulling of the colors on the fabrics as they bleed out into the wash water. Can I put my dyed fabric in the dryer after washing? Yes, as long as the fabric is dryer safe, you can dry it in the dryer after tie dyeing. After washing my dyed fabric, the color lightened or changed. Why did this happen? Some color change is normal after laundering because a small amount of tie dye washes out. Check the labeling on your fabric to make sure the fabric is 100% cotton or another natural fabric. If it’s polyester or a polyester blend, the fabric won’t absorb the dye as well and much of the dye will wash out during the wash cycle. If the fabric was not prewashed before tie-dyeing, any sizing left in the fibers can also affect how the dye absorbs. What is the difference between Tulip® Permanent Dye, Tulip® One-Step Dye and Tulip® Liquid Dye™? Tulip One-Step Dyes are formulated differently than our other dyes and activate with just the addition of cold water, which makes packing the dyes in their easy applicator bottles ideal. They’re great for creating a variety of multi-color (or one color) tie-dye effects. Tulip Permanent Fabric Dye requires very hot water and salt mixed in a larger container such as a bucket or sink to activate, and is ideal for one-color dyeing. Tulip Liquid Dye is meant for use in a bucket, sink or washing machine, and also requires very hot water and salt; it’s ideal for one-color/allover dyeing when you want the washing machine to do the agitation for a good color soak. How do I know which Tulip dye to use for my project? We recommend One-Step Dye for tie-dye projects, Permanent Fabric Dye for one-color/allover dyeing and Liquid Dye for one-color/allover dyeing for larger projects like towels that you can throw in the washing machine. Do Tulip® One-Step Tie-Dye Kits have to be used with hot water in order for the dye to work? No, our Tulip One-Step Dyes activate with cold tap water—they’re super easy to use! Just add tap water and shake, and you’re ready to go. We also offer Tulip Permanent Fabric Dyes that are used with hot water and salt, and Tulip Liquid Dyes that are formulated to use with hot water and salt in your washing machine. Can I dye a fabric multiple colors with Tulip® Permanent Fabric Dye? Tulip Permanent Fabric Dye is meant for one-color dyeing, so we recommend Tulip One-Step Dyes for tie-dyeing or dyeing a fabric multiple colors.